For a gift that ticks all the right boxes, look no further than TOKARA’s ultra-elegant Méthode Cap Classique. 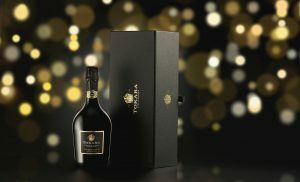 Let the maiden 2011 vintage, available in a slick black gift box, add a touch of style to your Christmas cheer. The depth of flavour is extraordinary and well worth the cellar door price of R650 including the stylish gift box. For more information, visit www.tokara.com.